Christmas is an ideal opportunity to encourage carers and families of people with dementia to reminisce about past festive times. This entry was posted in Lifestyle and tagged reminiscence on November 6, 2018 by Find Memory Care - Dementia. In Chef Hugh McGivern’s dementia food charter (written with Marsha Tuffin and the Abbeyfield Society and edited by Find’s director) he provides valuable information and nutritional values around best practice in Elderly nutrition when supporting residents with dementia to eat and live well. This entry was posted in Lifestyle on November 9, 2017 by Find Signage Dementia care. Care Home’s New Dementia Friendly Market Will Open Nov 1st! Find Memory Care and Orchid Care Home have been hard at work, designing Orchid Market Place – which will create a fantastic dementia friendly environment. This entry was posted in Dementia Products, News, Lifestyle on October 24, 2017 by Find Signage Dementia care. 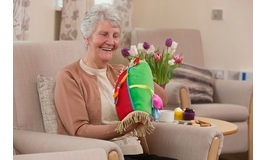 Can Fiddle Muffs Improve Dementia Care? This entry was posted in Dementia Products, Lifestyle on October 19, 2017 by Find Signage Dementia care. 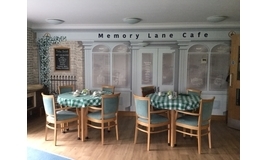 How dementia friendly design features have been incorporated into an existing care home. This entry was posted in Dementia Products, Lifestyle on October 9, 2017 by Find Signage Dementia care.